As The Blair Witch Project inches closer to the 20th anniversary of its creation, so too does the found-footage horror subgenre itself, marking decades during which the concept has had every opportunity to strengthen, evolve, or, as some folks would prefer, simply run its course. Since that creepy, folklore-based curio hiked into theaters and made a killing, some following entries into the genre have copied what it did well while switching up the supernatural or fabled subject being pursued by handheld cameras: Bigfoot, Norwegian trolls, a kaiju monster tearing up New York. Others have improved upon both the technology used to keep the concept up-to-date -- notably, using body cameras to avoid that "… are they really holding the camera on their shoulder this entire time?" conundrum -- as well as the situations in which cameras get involved in the first place, from news broadcasts and exorcisms to tracking the degradation of an Alzheimer's patient. Put simply, the found-footage idea has a lot of mileage on it, so it's maddening to see the tedious, haplessly formulaic Phoenix Forgotten duplicate so many of the known pitfalls that have haunted the subgenre for many years. The uniqueness of Justin Barber's film begins and ends with the real-world event around which it's based: the "Phoenix Lights", a phenomenon observed across Arizona and Mexico in the late ‘90s, where an unexplainable arrow-shaped formation of glowing orbs flew along the night sky on a few occasions. Without an official explanation, speculation naturally lead toward alien visitors as a possible answer, an idea mocked in public responses from the government. Phoenix Forgotten contains dual perspectives on the events, interwoven into a single narrative. One part features the real-time observations of three teenagers -- Josh (Luke Spencer Roberts), Ashley (Chelsea Lopez), and Mark (Justin Matthews) -- who disappeared in the desert shortly after the Phoenix Lights, transpiring through videotapes recorded by Josh as documentary footage about the possible alien connection. The other side takes place twenty years later, in which Josh's sister, Sophie (Florence Hartigan), decides to create her own documentary about their enigmatic disappearance, leading her to interview acquaintances and investigate clues. Just so it's clear: two guys and a girl filming a documentary about a paranormal mystery, one hotly debated as being real or not by the locals, inexplicably disappear during their search through the wilderness for evidence of its existence, leaving behind only the raw material shot on tape. Phoenix Forgotten clearly isn't oblivious or beholden to the similarities it shares with The Blair Witch Project, since Justin Barber front-loads the film with modern-day material centered on the sister's doc pursuits, replacing that signature found-footage disclaimer text with interviews and descriptions of what happened to the trio. Even this feels like a retread, though, mirroring the premise of the recent Blair Witch sequel, in which a sibling documents the search for the truth decades after the disappearance. The featureless execution of Sophie's investigation accomplishes little beyond charting a course to how this found footage gets, y'know, found, as well as breaking up the endless stretches of old, garbled home-video quality shots with crisp high-definition photography of the Arizona desert. 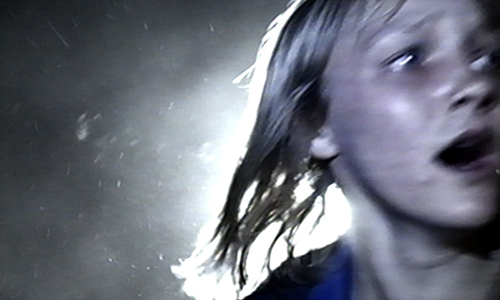 By taking place in the late-‘90s, the core events of Phoenix Forgotten avoid having to appear updated with modern technology, but doing so also forces it to stumble into the same traps as other entries into the subgenre -- shaky camera, patchy navigation, etc. -- even managing to amplify those documented issues and introduce a few of its own. With the help of the modern-day interviews spliced within Josh's raw footage, the initial reels are framed as examples of a possible movie-making talent chasing a supernatural urban legend, but they also chronicle an awkward teen infatuation through his interactions with his fellow "producer", Ashley. While it's reasonable that writer/director Barber wouldn't want to straight-up copy the structure and intention of The Blair Witch Project, the cluttered objectives and the interruptions of modern-day footage sidetrack the illusion and immersion of what's happening around Josh, thus pulling more attention toward wooden personal interactions and bland home-video visuals. Chalking that up to the nature of teenagers making an amateur doc only goes so far. Along the way, Phoenix Forgotten overlooks the tension that should be building to that expected point where their discoveries turn from vague, eerie hints at extraterrestrial encounters to when things start going bump in the night. There's anticipation involved with getting answers to how this trio of "filmmakers" disappeared, but little emphasis falls on exactly why they're in danger while wandering around a small patch of desert underneath where intergalactic travelers may have flown over. Had Barber's film surfaced a decade or so ago, before the likes of Grave Encounters and As Above So Below pushed further with the capabilities of terror and tech within the concept, this antiquated hike through the late-night Arizona landscape might've generated just enough novelty suspense to coexist with the subgenre as a science-fiction oddity. At this point, the rickety mechanisms that keep Phoenix Forgotten moving are so recognizable and uninspired that they'll make someone who once unfavorably compared the similarities between other found-footage horror movies reconsider the severity of their criticisms.